Most folks have played at least one game of pool in their lives. But when it isn’t convenient to head to your local pool hall or bar, why not play this classic game on your smartphone or PC? Don’t want to use your data or don’t have access to Wi-Fi? These free pool games are offline, so you don’t need an online connection. Helpful shooting guide to learn angles for best shot. Different cue sticks to change up gameplay. Can’t turn off cue guidance system. Obnoxious music and boring sound effects. Can’t play a regular game of pool. 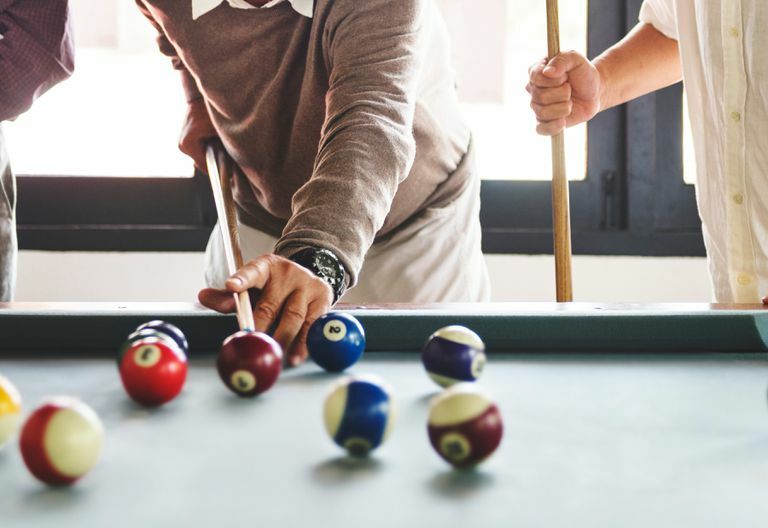 While not a full-blown pool game, Pool 2019 Free is primarily focused on leveling up through solo challenges. As you level, you unlock specialized cue sticks giving you certain advantages. You start out with the rosewood cue, which works pretty well with the game. If you’re new to online pool, the built-in cue guide will help you learn angles of shots and how much velocity to apply. However, the guides cannot be turned off in the free version. The game offers extra plays and refilling energy by watching ads, but these require you to be online. There's also another version of the game, but it requires an online connection, so make sure you select the FREE offline game. Ability to change cue and table. Play against a computer, arcade challenges, or practice. Playing against friends requires an online connection. Problems with online player cheating. Pool Billiards Pro is a nicely polished entry with its many options for offline gameplay. Gameplay is very smooth, and you're given an aim guideline which can be turned off once you’re comfortable making various shots. The game does have some cheesy background music which can also be turned off, but it has pretty realistic sounding sound effects to complement gameplay. Single player has several modes, including 8 or 9 balls against a computer, a practice mode, and an Arcade mode to complete different challenges while advancing levels. Plus, if/when you do want to play online, you can play against other players around the world. Ads appear after every game on the bottom of the screen. Background music can be monotonous. Pool Night is a simple pool game that has you completing different challenges as you progress through the city. The interface is clean and easy to use and provides an aiming guide to make shots easier. While this is a no-frills offline game, it still provides plenty of enjoyment and challenge to pass the time. Choice between 2D or 3D mode. Graphics are well done and polished. Game controls are responsive and realistic. Can only play practice mode or against the AI; no daily challenges available. Most of the customization requires you to spend your earned coins. Store is not available for offline play. 3D Pool Ball has a unique feature that allows it to be played in either 2D or 3D. Playing in 3D mode can give you some extra challenge, but the graphics are very sleek. Offline gameplay is limited to either practice games or against the A.I., but you're given a choice between 8 or 9-ball pool. Can play against another person offline. Scores don’t rotate when playing in landscape mode. Lack of practice or training guide. Micro Pool has some slick graphics for such a simple to use interface. Sporting 4 different game types: 8 ball, 9 ball, Killer, and Speed. This pool game provides hours of challenging fun, but if you find the game too difficult, there's a setting to adjust the opponent's strength. Another rare feature is the ability to play against another person offline. You and a friend can hand the phone off to each other after each round without using a data signal. Has a quick tutorial on gameplay. Allows you to curve your shot for more cue control. Comes in 14 different languages. Can’t exit a match without completely exiting the game. Have to connect to a social media account to get extra goodies. Nags for email signup every time game is loaded. 8 Ball Online Free Pool Game 2019 is a pretty straightforward game, but it does include a brief tutorial to help familiarize you with game controls; one of the nice control features is being able to curve your shot. While this might seem like cheating, it actually makes gameplay feel a bit more real. You also get a nice selection of games including 8 ball, 9 ball, Russian pyramid, and Snooker. Several interface settings to customize your gameplay and screen layout. Cue sensitivity adjustments are available as you improve your game. Can purchase upgrades with in-game coins. Offline games cost in-game coins to play. Most of the extras require a data connection. To level your avatar, you must play online games. 8 Ball Pool only offers offline play for 2 game types, but both offer loads of fun for you and a friend. Labeled as Practice Offline, this option offers 2 games types: Pass n’ Play and Play Quick Fire. Pass n’ Play allows you to play a game of pool with a friend by passing your mobile device back and forth; Quick Fire gives you 2 minutes to make as many shots as possible. Both are pretty fun to play with responsive game controls and enough challenge to keep you coming back for more. Has tons of different games. A variety of responsive controls. All games are offered offline. Ad supported, but can buy the pro version to eliminate. Pool Bread 3D Billiard Snooker hands down has the most game variety for a free pool game. Sporting 25 different games, all of them are also available to play offline, either playing against yourself or the AI. The pool table, background, cues are all customizable with a variety of colors and scenery. You even have the choice of a standard rectangular, round or hexagon pool table.